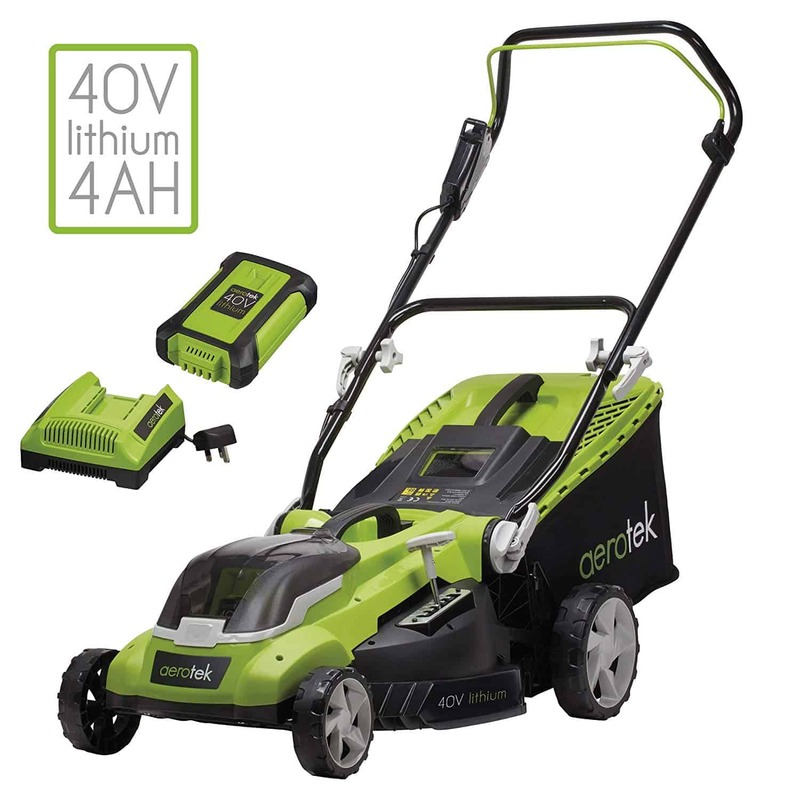 The Aerotek Cordless Lawnmower 40cm is a popular top seller that is highly rated and for many good reasons. 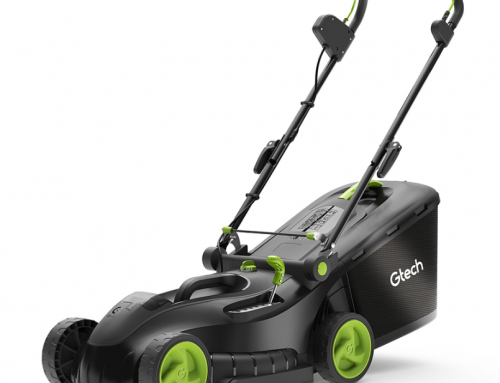 As you would expect from a cordless lawn mower it is light, convenient and easy to use. There is no effort needed with petrol and oil and they are extremely low maintenance. 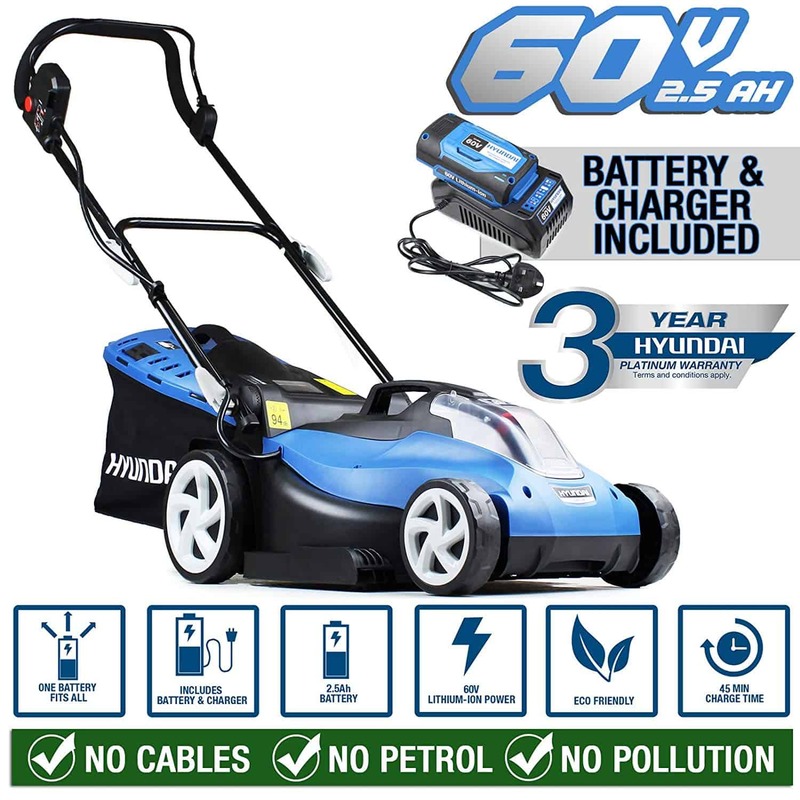 I will take you through the features and benefits of this Aerotek Cordless Lawnmower 40cm model while also pointing out the few potential drawbacks. This will help you decide if this is the perfect solution for your lawn maintenance needs. 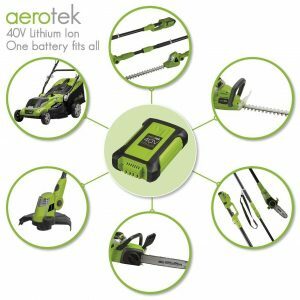 You may never have heard of Aerotek lawnmowers; well, I must say I am so impressed with the quality, features and the great value for money this brands offers. 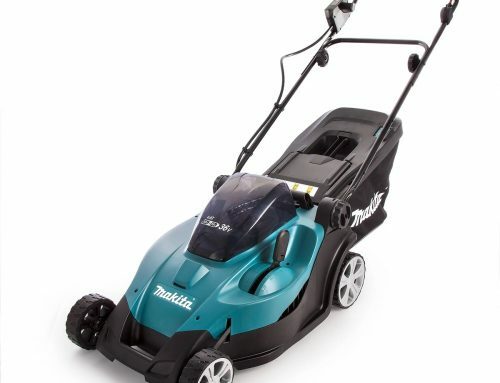 But are there any issues or downsides with this Aerotek Cordless Lawnmower 40cm? Let’s find out in my review where I will take you through each feature of the Hyundai mower and give you the lowdown on what this model can offer. The Aerotek Cordless Lawn Mower uses the improved and powerful Series X2 40V lithium-ion battery with 4Ah. This is superior to many of the batteries that come standard with cordless lawn mowers. The battery will give you about 35 minutes of use, depending on the condition and length of the grass as well as other factors. This is generally enough to do a 300 to 400 square meter lawn in one go. The batteries charge relatively quickly but it is always a good idea to buy a second battery. 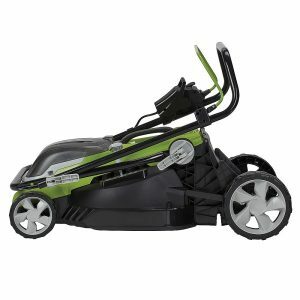 The older X1 batteries are not compatible with the Series X2 Lawn Mower range and other Aerotek Cordless garden equipment. 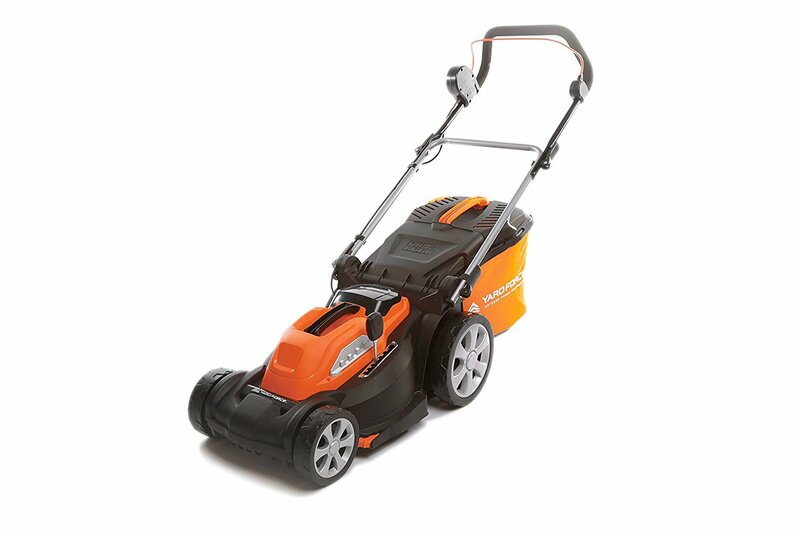 The 4 Ah battery produces a very respectable 3600 rpm helping to deal with thicker longer lawns. The Aerotek Cordless Lawn Mower is slightly louder that some of it’s competitors at 88dB but only slightly and is still up with the more quieter cordless mowers. 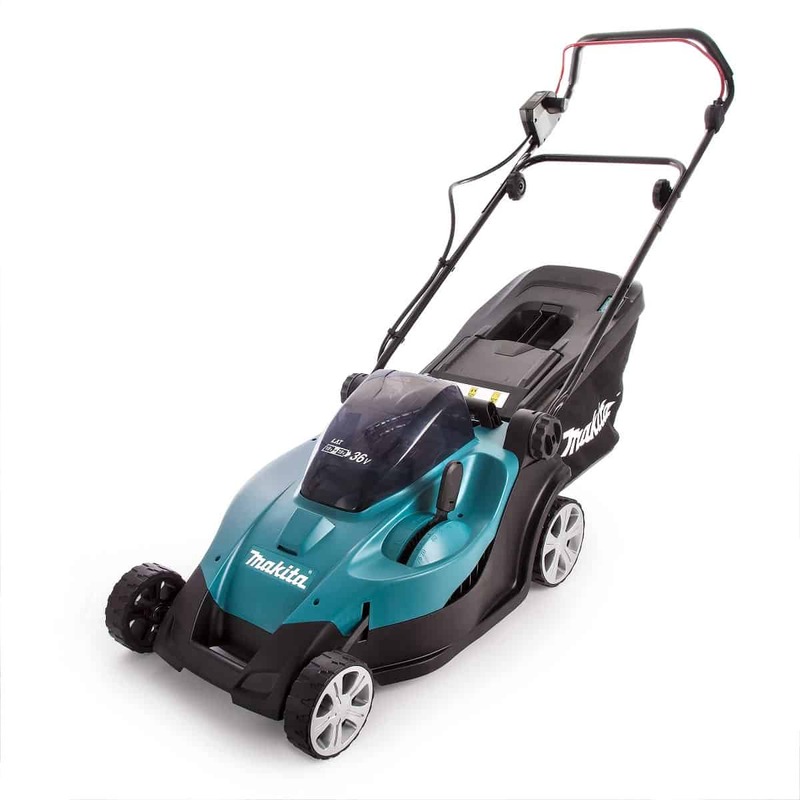 This mower can be assembled in around 5 min and is relatively simple with no tools required. The instruction manual is good and easy to follow. One thing I really like about this Aerotek Cordless Lawnmower model is the very generous 40cm cutting width. 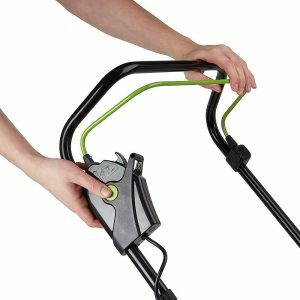 The large deck size and blade will make for quick work and maximise the amount you can do one a single charge. It means every pass has a wider cutting width and this will reduce time, effort and electricity. 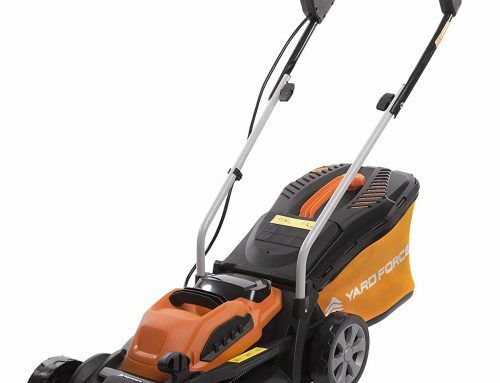 This larger than usual blade size on a cordless model saves on time but due to the design and lightweight build of the lawn mower, you can still move with ease. Even when cutting around curved edges it will move easily and cut with precision. Depending on when you last cut your grass, the type of grass and the amount of sun and rain you have had, you will need to adjust the cutting height. With some models, this is a frustrating time-consuming chore. Not so with the Aerotek Cordless Lawn Mower. You have a good range of 6 heights from 25mm and 75mm and the best part is that they are a breeze to change. It literally takes a movement of the lever and takes seconds. Compared to many other mowers, the height adjustment lever could not be easier. I have always rated mowers that can have their height adjusted from a single lever mounted in the centre of the mower. 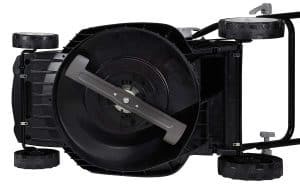 Having the lever mounted central to the mower makes the adjustment so much easier and smooth compared to mowers that have them mounted at the front or back with some even having to be adjusted on each side. 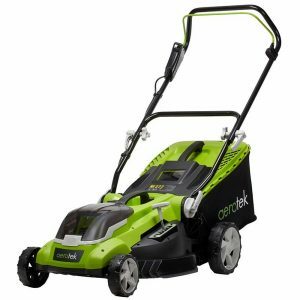 All in all, the Aerotek Cordless Lawnmower 40cm compares favourably to better known brands and mowers such as the Hyundai 38cm cordless mower. 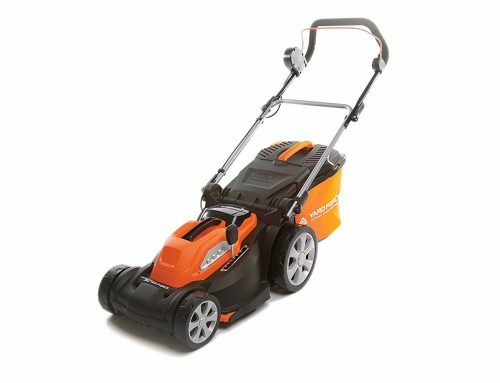 This is an exciting feature as most compact cordless mowers tend to have smaller blades and therefore a smaller cutting width. The Aerotek sports a robust 40cm blade making for faster cutting with less effort. This makes it efficient and effective and allows you to maximise the productivity you get out of a charged battery. 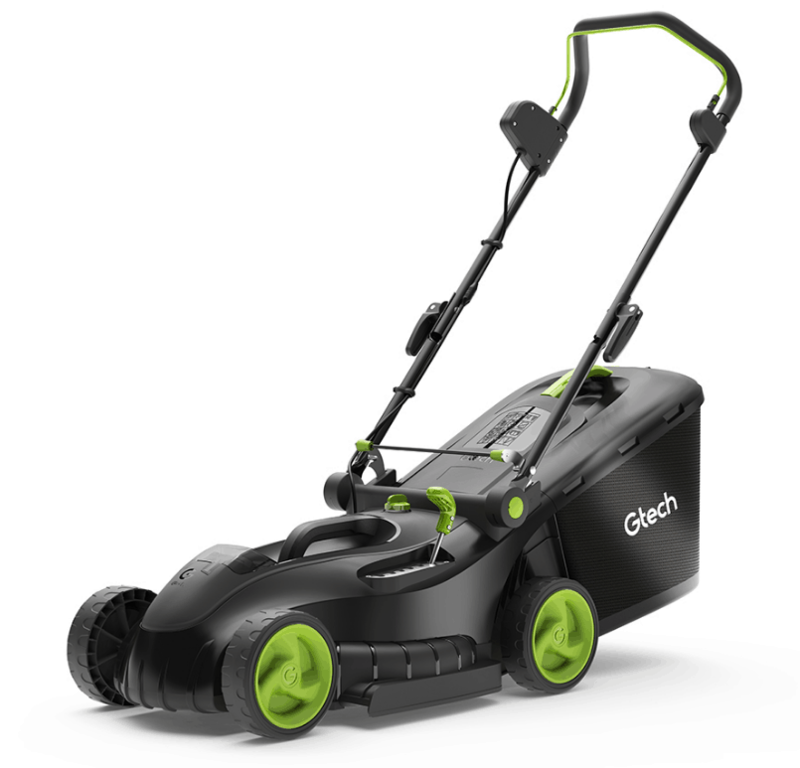 A larger blade is not always necessarily better but in the case of this model it works perfectly and will mean less passes over the lawn to cut the grass perfectly and evenly. The deck size and general construction is obviously optimised to accommodate this blade size for a generous cutting diameter. The 40cm deck size is a larger size mower, so please bare in mind that if you have narrow strips of lawn or a very small lawn, then perhaps a smaller deck size may be better suited. The only minor negative with the larger deck size is the increased storage space required when not in use. This model does not feature a rear roller to create a striped lawn effect. Although a striped lawn looks great, most people do not go to the effort of creating this look. It only works for specific gardens and requires precise and regular mowing. You do not get much bigger than the generous 50-litre grass box the Aerotek boasts. This will save you a lot of time and hassle as you will not need to empty it too often. While there is an indicator to show when the box is near full, the lawn mower will immediately shut off when the box is full so you will know it is time to empty it. This is a nice feature not found on competitors mowers. 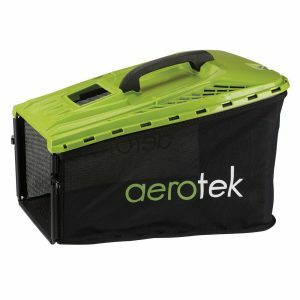 The Aerotek Cordless Lawnmower does not have a solid grass box but one that has a hard top and cloth sides and base that can be folded flat. So the advantages of this type of grass box is the minimal storage space, easy to assemble. The downside is the cloth sides and bottom are more prone to damage from tearing etc. however, the quality material on this Aerotek mower seems very hard wearing when compared to other makes. There are many practicalities to this model. It is light, compact and easy to store. It is amazingly easy to start and use while still being safe. The operation is comfortable and hassle-free. The battery is great and charges quickly. The large cutting width and grass box capacity will make you lawn maintenance quick and easy. Adjusting the height is as simple as moving a lever and the lawn mower is super low on maintenance needs. 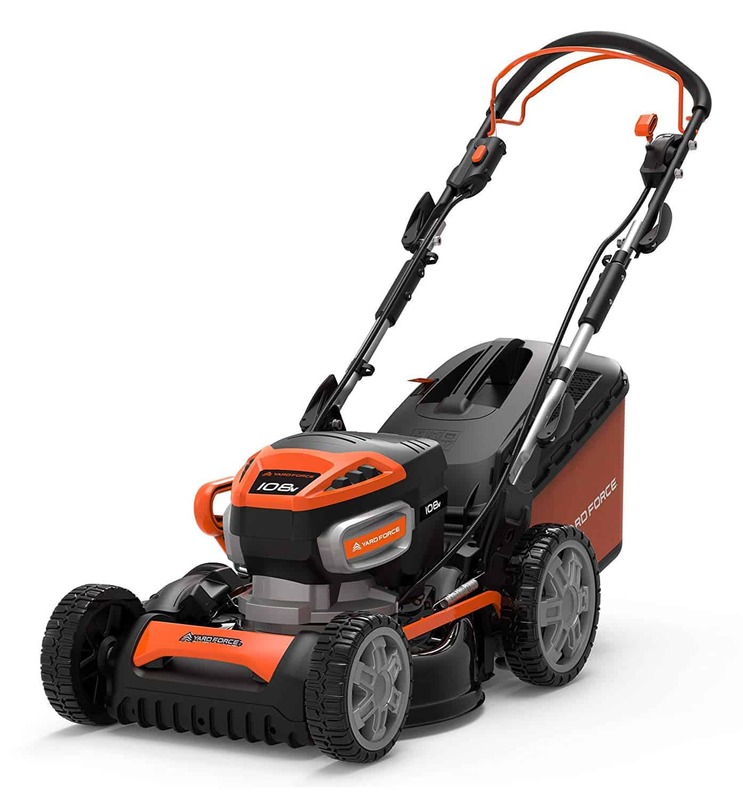 The Aerotek Cordless Lawn Mower has a relativity large footprint due to the width of the mower. 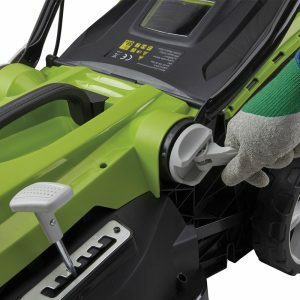 The 4 clips on the side of the handles are quick release and allows for the top handle to be folded down and additional clips near the body of the mower allows for the lower bars to also be folded down, this is a nice feature. There is no separate safety key with the Aerotek Cordless Lawn Mower as found with other cordless lawn mowers. In order to start the machine, you need to use the lock-out button that needs to be engage and apply the Operator Presence control lever. I don’t believe the lack a safety key is such a big issue. You will find that if you did have a safety key it would not be used and is often lost or misplaced. 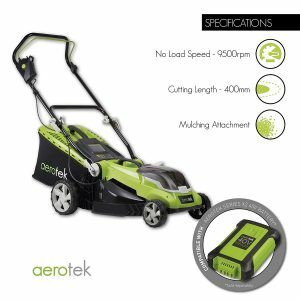 Something that is quite rare in cordless lawn mowers in this range is that the Aerotek comes with a mulching feature. It is easy to use and provides many benefits to your lawn. The finely cut grass will slowly breakdown to return valuable and essential nutrients back into the soil. Mulching will also save on time emptying the grass box and will mean you need to fertilise less often. Another benefit is that it will make your lawn more water-wise. 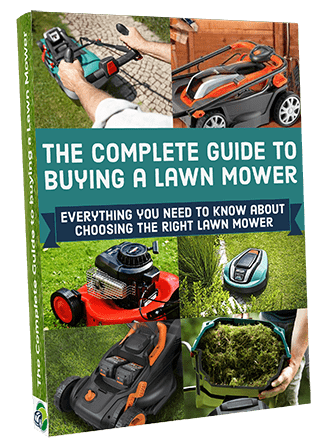 This really makes this mower better that some of its competitors and is a feature that is actually beneficial to your mowing and the condition of your lawn and not just a gimmick. Good job Aerotek! I really like this lawn mower and I am clearly not alone. It ticks all the boxes for a great cordless option and performs well. The fact that it saves time and hassle makes it a great option for most lawns. 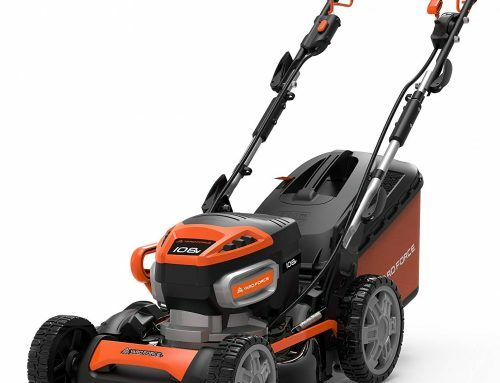 The battery performs well and it delivers enough power to tackle all but the roughest lawns. The mulching feature is also a great benefit to many gardeners. 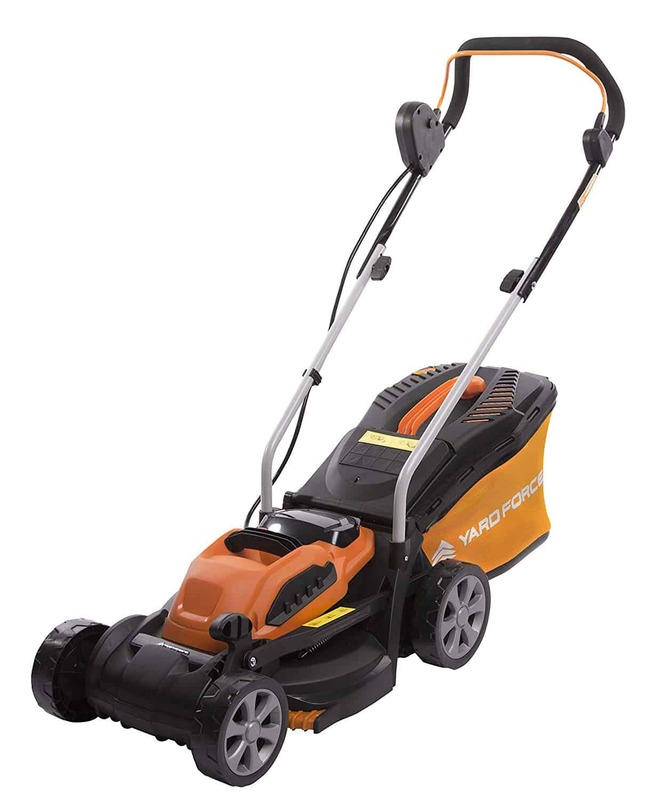 Apart from being safe and easy to use, it is a reliable lawn mower that delivers good results. It is certainly a model to consider. There are not many reasons not to buy this lawn mower. It is reasonably priced, durable and has a good warranty. It is nifty and easy to move around while still able to handle larger size lawns. Sure, you are restricted by the batty life but you can always purchase an additional battery. As an added bonus, these can be used with other Aerotek cordless garden tools. The large 40cm cutting width and 50-litre grass box will make your job fast and hassle-free. There is so little negative feedback on this product that Aerotek must be doing a lot right. Unless you really need a rear roller for a striped lawn or you have a very large patch of lawn, this is a good option. Of course this is open to interpretation so if you don’t fall under every single one then don’t worry I’m sure you’ll still love the Aerotek Cordless Lawnmower 40cm. It has loads of great features that I’m sure you make use of even if you’re not its perfect customer.